I have a real soft spot for the Museum. – Probably because I used to work there (as an unpaid volunteer) a few years back, and I spent hundreds of hours there. I got tricked into it really. You see... George McGregor was the new curator then and he had just inherited a Museum full of fantastic old stuff... but it was generally unorganized and not particularly well displayed. He asked me down one day for some advice. He said "Jan... what do you think if we have a big photo blown up and put on the wall there so that you see it as you walk into the Museum...?" Anyway then George said "What if we got someone to paint it on?" (I should have seen it coming but I blundered blindly on saying)… "Do you know anyone who would do that? It’s a HUGE space!" "Well.." says George (with a little grin on his lips) "How about you? You've just painted a mural or two on the bridges.."
Well, I was trapped. Even my protestations about being scared of heights didn’t cut it with him. George just built me a very sturdy platform and off I went, painting the mural which still graces the main entrance to the Museum today. Then after the mural was finished George said "That Mezzanine floor up there looks ugly… How can we disguise it?" "Hmmm" (that’s me thinking) "Well, that mural is a street scene... How about we expand the street out here towards the people. We could make shop-fronts and verandahs and..."
"And we could have a telegraph pole and a house.." (George has a thing about telegraph poles as he used to work for the post and telegraph) "We need old iron, verandah posts, doors, windows..."
And that's what we did. We even incorporated the actual historic shop hoarding of the infamous Professor Moore who was a shady character from Waipawa’s past. George and I sparked ideas off each other all the time. 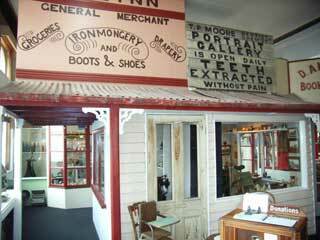 It started with the mural, then went to shop frontages, and the house and then finally back into the shed. I had the artistic ability to paint and arrange displays, and George had the practical know-how to build and make these things happen structurally. The Museum mushroomed and changed. On the southern side of the Museum a warren of little tiny displays of cluttered treasures became opened up and transformed into the rooms of a house from around 1900. We were very careful not to just have jumbles of hundreds of potties and beanslicers etc, but, to make these rooms look as if the occupant of the house had being doing something and had suddenly been called away. 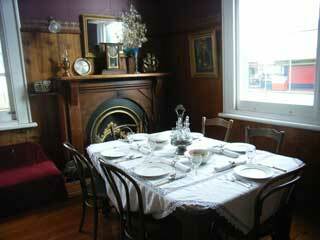 The dining room had the table set as if the family were about to sit down to dinner, the kitchen had the iron heating on the coal range and the ironing blanket spread on the table and a basket of washing ready to do the ironing. It was fun doing these displays, but it did have some challenges along the way – demolishing walls to make corridors, pulling down roofing tiles to find the beautiful timber ceiling we thought was there was only half there, building ceiling roses, and painting tiles for fireplaces… just to name a few. 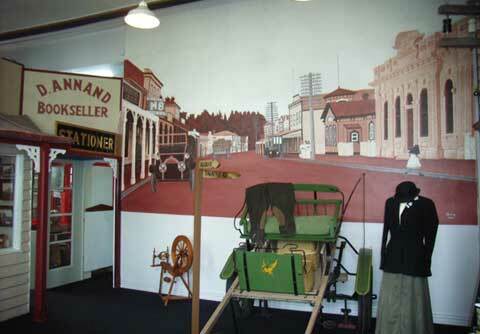 But what was created truly made the CHB Settlers Museum into "Central Hawkes Bay’s Best kept secret"
"Sam’s shed" out the back was more George’s domain than mine. 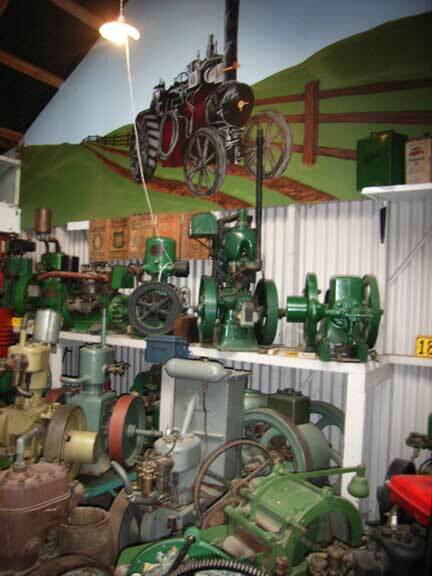 It's full of old engines, saws and farming memorabilia. I didn't go out there too often - as it was seen more as the 'man’s domain'. But I did get dragged in once or twice to paint a traction engine on the wall, and to give advice to George’s display techniques. Anyway, that's what we did, and that's what's there today - along with a replica of the picket fence which ran between the post office and the bank building. 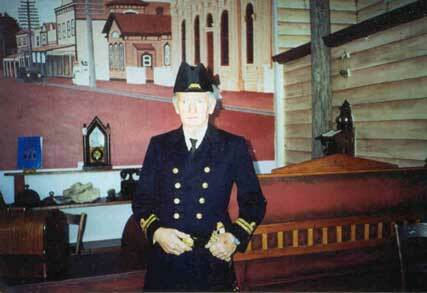 The exhibition hall was named "The George McGregor Hall" when George retired. Today the Museum has a new curator, Rosheen, and a very enthusiastic group of volunteers who look after our Museum. I see it as a well worthwhile place to look around. It not only has amazing displays to wander around, but also an old bank vault full of historical documents and photos of our region’s past. So pop on in and have a look.